The Psychology Of Motivation is a powerful video course which shows you the way towards moving forward without distractions and producing something you never thought you were capable of. As some would put it, it’s about getting into the zone. It’s when you enter a state of mind where your focus level is so strong, you can’t be deterred. Everyone wishes they could do more or achieve more. But often our brains just aren’t wired that way. Few people are able to reach the level of motivation needed to hit their goals. Those who do tend to be the most successful. 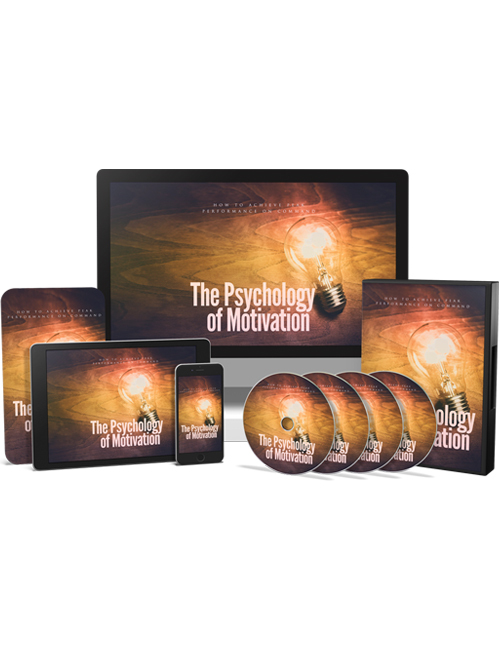 In this video course which complements The Psychology Of Motivation ebook, you’re going to learn things that will make you wonder about your true potential and whether you can really summon up that motivation to reach your absolute best in life. Many people have. And those who have say that anyone can if they desire to. It’s all about how much you truly want it. You will discover how to focus on your goals, how to change your mindset and find that level of motivation you never thought you had, how to stay focused, how to get an additional level of motivation from people around you, understanding the states of flow and much more. This course is packed with real practical content that will ensure you get the best out of yourself going forward if you have the desire to make it happen. Everything begins with you. Once you hit the download button, the journey begins. Package includes a professional sales-letter and ready-to-go sales materials.